Generous donation on the great Christmas Party of Exyte! With lots of good wishes and a very generous donation Exyte is saying good bye to Heiko! This happened during the Christmas Party of Exyte. 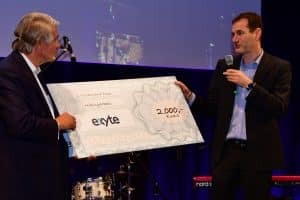 For Exyte it is important to support social committment. Next to other projects they choose our project. 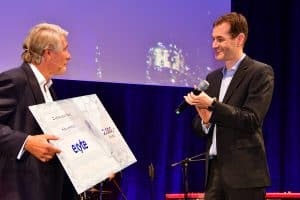 On the big stage Heiko was given the symbolic check over 2000€. 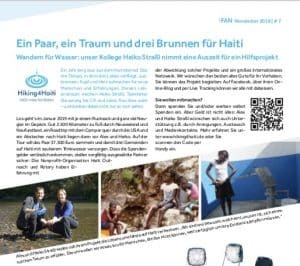 In addition to this Exyte also published our project and the living conditions in Haiti in their international newsletter. Great!! Heiko and me are very excited and thankful for this support. Also for the invitation to this great Christmas event! Together with the check and a lot of dear wishes there is a condition which we will follow happily: To tell and send reports of our project, our experiences on the trails and the visit of Haiti. This is something, we will do for sure! With this donation we got now 1/4 th of the second well! Thank you so much to the board of Exyte and the whole workforce! !